Kronprinz was ordered under the provisional name Ersatz Brandenburg and built at the Germaniawerft shipyard in Kiel under construction number 182. [b] Her keel was laid in May 1912 and she was launched on 21 February 1914. The ship's namesake, Crown Prince Wilhelm, was to have given the launching speech, but he was sick at the time so Prince Heinrich, the General Inspector of the Navy, gave it in his place. Crown Princess Cecile christened the ship. The ship was scheduled to be completed in early 1915, but work was expedited after the outbreak of World War I in mid-1914. Fitting-out work was completed by 8 November 1914, the day she was commissioned into the High Seas Fleet. Kronprinz was completed in November 1914; following her commissioning she joined III Battle Squadron of the High Seas Fleet. Gottfried von Dalwigk zu Lichtenfels served as the ship's first commander. Kronprinz completed her sea trials on 2 January 1915. The first operation in which she participated was an uneventful sortie by the fleet into the North Sea on 29–30 March. Three weeks later, on 17–18 April, she and her sisters supported an operation in which the light cruisers of II Scouting Group laid mines off the Swarte Bank. Another sweep by the fleet occurred on 22 April; two days later III Squadron returned to the Baltic for another round of exercises. On 8 May an explosion occurred in the center turret's right gun. The Baltic exercises lasted until 13 May, at which point III Squadron returned to the North Sea. Another minelaying operation was conducted by II Scouting Group on 17 May, with the battleship again in support. Kronprinz participated in a fleet operation into the North Sea which ended without combat from 29 until 31 May 1915. In August, Constanz Feldt replaced Dalwigk zu Lichtenfels as the ship's captain. The ship supported a minelaying operation on 11–12 September off Texel. The fleet conducted another sweep into the North Sea on 23–24 October. Several uneventful sorties followed on 5–7 March 1916, 31 March and 2–3 April. Kronprinz supported a raid on the English coast on 24 April 1916 conducted by the German battlecruiser force of I Scouting Group. 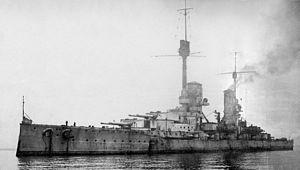 The battlecruisers left the Jade Estuary at 10:55 CET,[c] and the rest of the High Seas Fleet followed at 13:40. The battlecruiser Seydlitz struck a mine while en route to the target, and had to withdraw. The other battlecruisers bombarded the town of Lowestoft unopposed, but during the approach to Yarmouth, they encountered the British cruisers of the Harwich Force. A short gun duel ensued before the Harwich Force withdrew. Reports of British submarines in the area prompted the retreat of I Scouting Group. At this point, Admiral Reinhard Scheer, who had been warned of the sortie of the Grand Fleet from its base in Scapa Flow, also withdrew to safer German waters. Kronprinz was present during the fleet operation that resulted in the battle of Jutland which took place on 31 May and 1 June 1916. 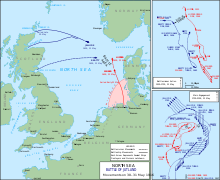 The German fleet again sought to draw out and isolate a portion of the Grand Fleet and destroy it before the main British fleet could retaliate. Kronprinz was the rearmost ship of V Division, III Battle Squadron, the vanguard of the fleet. She followed her sisters König, the lead ship, Grosser Kurfürst, and Markgraf. III Battle Squadron was the first of three battleship units; directly astern were the Kaiser-class battleships of VI Division, III Battle Squadron. Directly astern of the Kaiser-class ships were the Helgoland and Nassau classes of II Battle Squadron; in the rear guard were the obsolescent Deutschland-class pre-dreadnoughts of I Battle Squadron. After returning to III Squadron, Kronprinz took part in squadron training in the Baltic before conducting defensive patrols in the German Bight. In early 1917, the ship became the flagship of the deputy commander of the squadron, at that time Rear Admiral Karl Seiferling. During training maneuvers on 5 March 1917, Kronprinz was accidentally rammed by her sister ship Grosser Kurfürst in the Heligoland Bight. The collision caused minor flooding in the area abreast of her forward superfiring turret; Kronprinz shipped some 600 t (590 long tons; 660 short tons) of water. She again went into the drydock in Wilhelmshaven, from 6 March to 14 May. On 11 September, Kronprinz was detached for training in the Baltic. She then joined the Special Unit for Operation Albion. In early September 1917, following the German conquest of the Russian port of Riga, the German navy decided to eliminate the Russian naval forces that still held the Gulf of Riga. The Admiralstab (the Navy High Command) planned an operation to seize the Baltic island of Ösel, and specifically the Russian gun batteries on the Sworbe Peninsula. On 18 September, the order was issued for a joint operation with the army to capture Ösel and Moon Islands; the primary naval component was to comprise the flagship, Moltke, along with III Battle Squadron of the High Seas Fleet. V Division included the four König-class ships, and was by this time augmented with the new battleship Bayern. VI Division consisted of the five Kaiser-class battleships. Along with nine light cruisers, three torpedo boat flotillas, and dozens of mine warfare ships, the entire force numbered some 300 ships, supported by over 100 aircraft and six zeppelins. The invasion force amounted to approximately 24,600 officers and enlisted men. Opposing the Germans were the old Russian pre-dreadnoughts Slava and Tsesarevich, the armored cruisers Bayan, Admiral Makarov, and Diana, 26 destroyers, and several torpedo boats and gunboats. The garrison on Ösel numbered some 14,000 men.